Plans Falling Through | We Got The Tips You Need This Australia Day! Australia Day Plans – We’ve Got You Covered! What does Australia Day mean to you? Whatever significance the long weekend holds, it is a time to reflect on what it means to call this great country home! We celebrate our freedom, our way of life and our diversity. Whether you belong to our Indigenous or Torres Strait Islander community who have called this land home for over 60, 000 years, or you have recently migrated to call Australia home – we celebrate and acknowledge the contribution every Australian makes to our extremely diverse nation. Our capital cities are set to pull out all the stops to make it another great long weekend of celebration and festivities. There is, without a doubt, something for everyone! How Will You Celebrate This Australia Day? What’s On For The Family In Brisbane? With Australia Day falling on a Saturday this year, Brisbane is putting on a show with some fantastic events for the whole family! If live music, face painting, awesome food and jumping castles are your thing then head down to Victoria Park for a weekend of family fun that won’t break the bank! The fun doesn’t stop there. So, gather the kids and head over to South Bank in the evening to take in the famous Australia Day fireworks display! 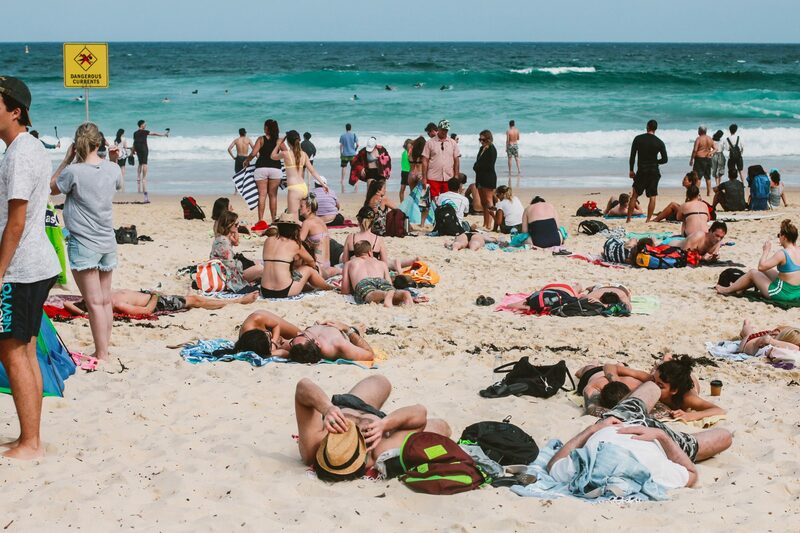 If the beach is more your style, then why not head an hour down the road to the beautiful Gold Coast and experience some of Australia’s most beautiful beaches. Enjoy a swim and some fish and chips by the beach! Something A Little Less Family Oriented in Brissie? Want something to really get the heart racing this Australia Day? Head down to the Story Bridge Hotel for the annual Cockroach Races! The first race kicks off 12 noon with a whopping 14 races throughout the afternoon. The afternoon also features food, music and drinks as well as a $2,000 prize to the best-dressed team! Entry into the annual Cocky Races is a gold coin donation which will go towards supporting Youngcare Australia. If the pub scene is more your thing then head down to Alfred and Constance for their first official Australia Day House Party. This epic event is set to impress – kicking off at 2 pm with live music and entertainment as well as a free sausage sizzle. So, grab a cold beer and enjoy some tunes on the deck! As usual, Sydney will not disappoint this Australia Day with more fun than you can poke a stick at! There will be plenty of family entertainment on offer with the Children’s Festival taking place between 11 am and 3 pm in Summer Playground at Tumbalong Park in Darling Harbour. For something a little more cultural head down to Walumil Lawns at Barangaroo Reserve and the Sydney Harbour Bridge for the Wugulora morning ceremony. Check out the Koomurri Aboriginal Dance Troupe as they perform a traditional smoke ceremony and sing the national anthem. This free event is definitely something the whole family can enjoy! What Else Does Sydney Have To Offer This Aussie Day? You are not going to want to miss this years’ Australia Day Live at the Sydney Opera House! Featuring some of the countries best-known artists, this event is not to be missed! Head down to Circular Quay to make the most of what the evening has to offer whilst enjoying the spectacular fireworks throughout the show! If the pub scene is more your style Watsons Bay Boutique Hotel is set to party mode this Australia Day long weekend. With seats right by the water, the pub will be offering a host of DJ’s spinning your favourite Aussie classics all afternoon! Would it really be Australia Day without Melbourne’s annual Australia Day Parade? With over 1,000 participants from over 80 community and cultural groups, the city will be treated to an outstanding display of what makes our country truly outstanding. This free event is a great opportunity to get the family out and about immediately following the Official Flag Raising Ceremony. Why not finish the day on a high with the spectacular fireworks display down at Docklands! This part of the city will come alive with a host of amazing food and entertainment that is not to be missed! Something A Little Less Family Oriented in Melbourne? Does a giant adult friendly jumping castle sound like your style? Well, make your way down to the Grand Pavilion at the Melbourne Showgrounds for the world’s biggest inflatable obstacle course this Aussie Day all the way from the U.K! Get in quick as it is only in town from the 26th to the 28th! After a day of bouncing around, head to Melbourne’s rooftop cinema to knock back a cold beverage and experience an all-time Aussie classic… the hilarious Toni Collette in ‘Muriel’s Wedding’. What a way to end a full on day of Aussie fun! What Is Perth Offering For The Family? A big breakfast is the best way to start the day, right? So, why not head down to Sir James Mitchell Park, Coode Street, South Perth from 8 am for the annual Morning Ceremony and Great Aussie Breakfast. After the raising of the flag, our newest Australians will be welcomed with a traditional Welcome to Country before being officially inducted as brand new Aussie citizens – what a day to remember. Following the more official proceedings, the BBQ is set to sizzle with the Rotary Club of Como providing an amazing spread for breakfast. Free entertainment will also be on offer – so there is definitely something on offer for the whole family. What Does The Perth Pub Scene Have to Offer? Embargo On The Point is offering an awesome Australia Day spectacular from 3 pm with 2 stages of live music, multiple indoor and outdoor bars as well as the best view of the spectacular fireworks display. Tickets ranging from $40 – $60, you will not want to miss this! However, if the beach is more your style this Aussie Day head down to the Australia Day Coogee Beach Festival for watermelon eating and sandcastle building competitions and a free sausage sizzle. Still can’t get enough sausages into you? Check out the MVMNT Ausday BBQ in Northbridge for a free sausage sizzle and a cold beverage from 2 – 5:30 pm. Staying In This Aussie Day Long Weekend? Sunscreen, Sunscreen, Sunscreen! Make sure you lather on that 50+ and slap on a hat to avoid those harmful UV rays -no one wants to spend the next week smothering themselves in aloe vera. Drink water! If you do decide to have a drink – or few – make sure you have some water handy as this is the best way to avoid dehydration and that horrendous morning-after headache! Relax a little. If you’re planning on spending the day working on your tan, make sure you schedule some chill out time – in the shade! Don’t let the day end before it even begins. After all, you will have to be alive and well if you want to hear what is voted number 1 in this year’s Hottest 100. Grab a sausage! Without a doubt, one of the best ways to celebrate Australia Day is with a sausage sizzle. Whether it’s at your local pub or over the BBQ in the backyard invite some friends around and enjoy a sausage in bread – doesn’t get more Aussie than that. Enjoy! Make the most of the long weekend and our beautiful country. Get out and about with friends and family wherever you are and celebrate what makes our nation so unique – whatever you cause for celebration. Remember what the long weekend means to you. Australia Day Plans - We've Got You Covered! Overall rating: 4.8 out of 5 based on 60 reviews.